KUALA LUMPUR, February 8, 2018 – The first-ever Ranger Raptor, Ford’s new off-road, performance pick-up truck, blasted out from behind its camouflage during a reveal event in Thailand today. At the front, a stunning new grille takes styling cues from the world’s first factory-built high performance off road truck, the F-150 Raptor. The iconic block FORD lettering proudly positioned within the grille design is unmistakable when emerging from a dust cloud. A frame mounted front-bumper system is designed to offer desert durability performance and a distinctive presence. The front bumper also includes new LED fog lamps with functional air-curtain ducts, which help to reduce air resistance of the body. Vehicle stance is noticeably bigger from every angle, standing at an impressive 1873mm tall, 2180mm wide and 5398mm long, with wider front and rear tracks at 1710mm. Ground clearance is increased to 283mm, while the approach angle of 32.5, ramp over angle of 24。, and departure angle of 24。as a package are superior to anything seen before. Leading the way in connectivity, SYNC 3 is a fully integrated, voice activation system that lets the driver use their favourite devices while their hands stay on the wheel and eyes on the road. The Satellite Navigation System comes into its own when off-roading in remote areas, even offering a ‘breadcrumb’ feature to leave a trail when entering unchartered areas – perfect for the serious off-roader. 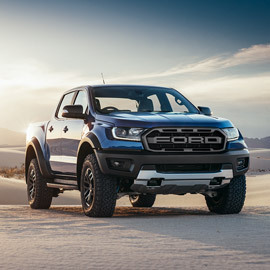 Click Here To Register Your Interest and Find Out More About Ford Ranger Raptor.